Hey there friends! 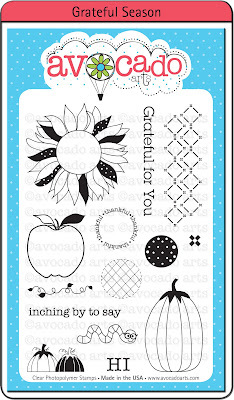 I'm happy to share with you Avocado Arts' September release, Grateful Season. This set has fabulously big stamps like a sunflower and pumpkin, mixed with a fun and cute little worm and my personal favorites, borders and patterned stamps like the hatched and dotted circles. Here's what I designed using this adorable fall set. The border stamp has this cute cross-stitching feel to it which is pretty and very country fresh! I stamped a lighted green cross-stitched block over the border to create some movement. I mixed the sentiment with some letter stickers to personalize the card! This is such a fun card! Love how you mixed the flower with the border, and also that great strip of red washi/paper and the alpha stickers! Stunning card, Emily! I love the pattern you created down the left hand side of the card! AMMMMMMAZING as always! LOVE the stamping on the side....love the flowers and ribbon....LOVE it all! Really--how do you do it? I love your creativity! 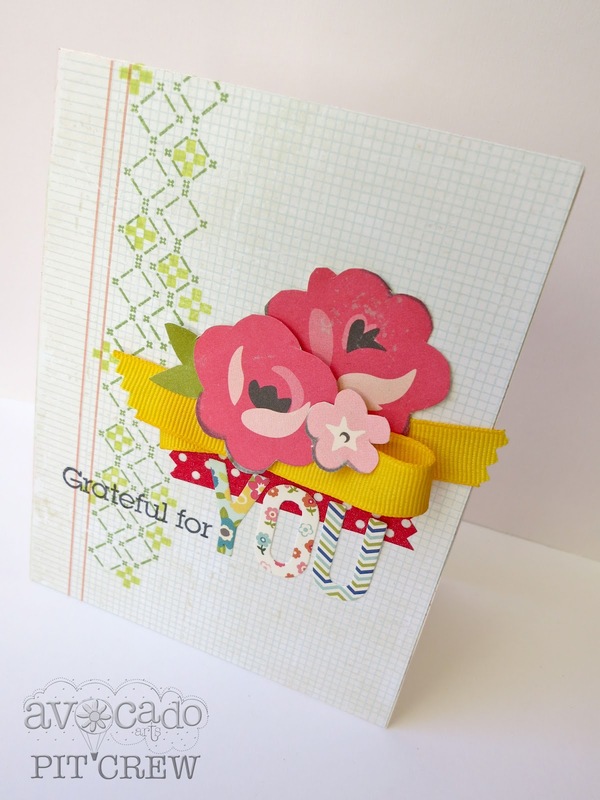 very creative idea with the border...tucking that little flower into different blocks in the border....great idea! Wonderful looking card and like the way you layed everything out. Awesome!